The Italians love to cook. The two most important elements? Great ingredients and a tried and true recipe. They spend centuries perfecting their family recipes; passing them down from generation to generation, improving them, modernizing them, making them even more delicious. We are proud to share our family recipes with you and as always, provide the freshest, most authentic ingredients. Felice Cucina! Bring a large pot of lightly salted water to a boil over high heat. 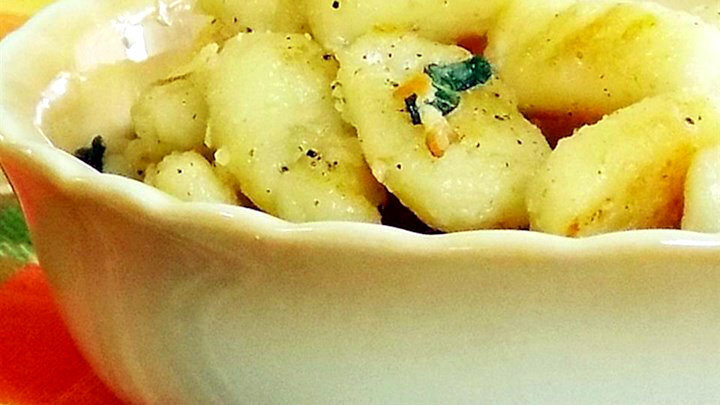 Add the gluten free gnocchi pasta, and cook until they float to the surface, 2 to 3 minutes; drain. Melt the butter in a skillet over medium heat. Stir in the garlic, and cook until the garlic has softened and is beginning to turn golden brown, about 4 minutes. Stir in the sage and salt for a few seconds, then add the cooked gnocchi. Toss gently with 1/4 cup of the Pecorino cheese and the pepper. Sprinkle with the remaining 2 tablespoons Parmesan cheese to serve. Peel and chop the garlic, slice the shallots. Heat the extra-virgin olive oil in a pan, add the garlic and shallots. Sauté for a few minutes or until the shallots turn golden then, remove the garlic cloves. Add the semi-dried cherries to the pan with a pinch of sugar. Cook for a few minutes, season with salt and black pepper. At the end of the cooking time, add the thyme or Lemon verbena. Meanwhile, cut the salted ricotta cheese into thin slices. Cook the Bucatini in a large pot with plenty of salty water, adding one teaspoon of extra-virgin olive oil and follow the instructions indicated on the package. Once drained, place the pasta in the pan with the sauce and toss briefly. 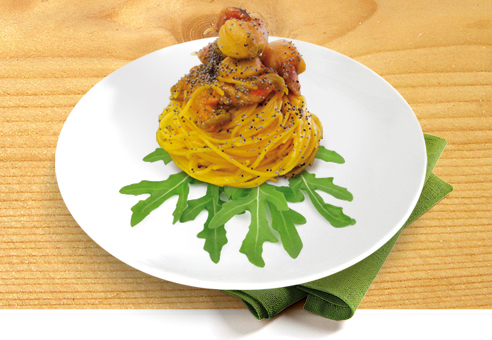 Top generously with ricotta, dress with a leaf of thyme or Lemon verbena and serve. Slice and dice the onion very thin and sauté in a pan with a few tablespoons of extra-virgin olive oil. Add the sausage, when the meat starts browning, add the fennel seeds and eventually season with salt. Clean and chop the fennel bulbs into slices. Allow the slices to soak in iced-cold water. In a small pot, heat the milk, add the saffron and thicken with the corn starch. Toss constantly until boiling or until a creamy sauce is formed. Then, add the drained and dried fennels, sprinkle with coriander and season with salt. Cook the Caserecci in a large pot with plenty of salty water adding one teaspoon of the olive oil and following the instructions indicated on the package. Once drained, sauté the pasta with the sauce. 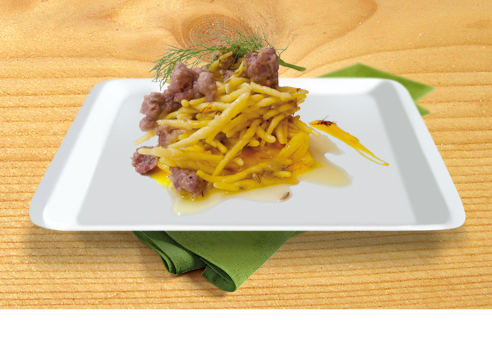 Serve the Caserecci on a bed of fennel colored with saffron and dress with some fennel seeds and saffron pistil. Chop up the onion and garlic then sauté in a pan with the fennels seeds and the sausage broken up into small pieces. Add wine and simmer for a few minutes until reduced then add the crushed tomatoes and continue to cook for 30-40 minutes. Add salt and pepper to taste. 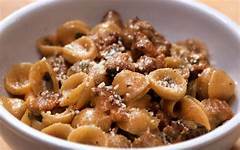 Meanwhile, boil the orecchiette pasta according to package directions, drain and toss with the sausage sauce, the pecorino cheese and the olive oil. Serve immediately. In a large sauté pan, heat extra virgin olive oil and stir the sea scallops until brown and fragrant. Then, simmer with white wine until reduced and sprinkle with black pepper. Clean and chop the zucchini blossoms into thin slices. Squeeze the orange and reserve the juice. Transfer the zucchini blossoms and the orange juice to the pan adding a tablespoon of vegetable broth and salt. Cook the linguini in a large pot with plenty of salty water adding one teaspoon of extra-virgin olive oil and following the instructions indicated on the package. Once drained, place the pasta in the pan with the sea scallops and zucchini blossoms, adding some more vegetable broth, if necessary. 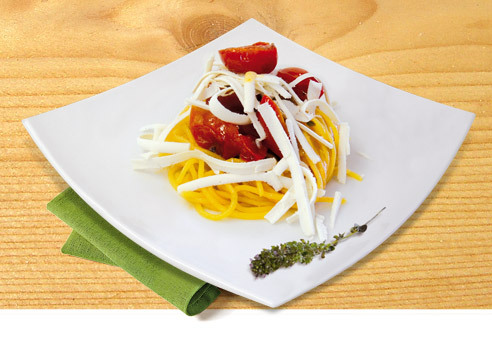 Serve the linguini on a bed of rocket salad with poppy seed and grated orange peel. Squeeze the shallots from their skins and mash. In a large sauté pan, place extra virgin olive oil, add the shallots and cook until brown. Add the pre-cooked peas, milk, one garlic clove and cook for some minutes. Add the mixture in a pot and cook until it slightly reduces. Cook the Marcelli Formaggi Gluten Free Mezzi Rigatoni in a large pot with plenty of salty water, adding one teaspoon of extra-virgin olive oil and following the instructions indicated on the package. Once drained, place the pasta in the pan with the peas sauce, add a tablespoon of vegetable broth and toss briefly. Strew the surface with pure truffle powder, very finely minced, and serve. In a large sauté pan, heat extra virgin olive oil, add the garlic and the chili pepper until beginning to brown. Add the brandy and cook until the liquid is reduced. 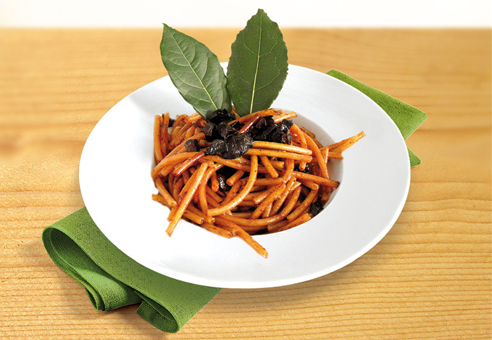 Place the mostocotto, laurel leaves, salt and black pepper to taste. Cook over low heat until the mixture is slightly creamy and the wine reduced. Cook the bucatini in a large pot with plenty of salty water adding one teaspoon of extra-virgin olive oil and following the instructions indicated on the package. Once drained, place the pasta in the pan with the wine sauce and toss briefly. Top with a laurel leaf and eventually, sprinkle with Pecorino cheese and serve. Cook penne in boiling salted water until al dente, or about 2 minutes less than directed on the package. Meanwhile, heat oil in a large deep skillet or saucepan. Add onion, mushrooms, carrots, peppers, garlic and basil. Cook until vegetables are soft, about 8 minutes. 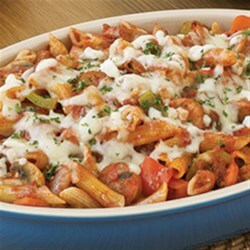 Stir in tomato sauce, sausage, cooked pasta and 2 Tbsp. parsley. Heat through. Transfer to a 13x9-inch baking dish. Sprinkle evenly with remaining parsley and pecorino cheese. Bake 10 to 15 minutes until cheese is melted. Let stand 5 minutes before serving.